Arms: Quarterly: First and Fourth: Azure three luces haurient Argent in chief and in base an anchor with the crossbar supporting a pair of balances Or. (Way of Plean) Second, grand-quarterly: First and Fourth: Or a rose Sable seeded Or on a chief Sable a swan's head and neck erased between two mullets Or. (Squire) Second and Third: Ermine three parrots Vert beaked and legged Gules palewise in bend sinister, and in dexter chief a crescent Gules. (Parlett), the total grandquarter being (Squire of Rubislaw). Third: per fess enarched Gules and Or, in chief two Chinese lotus flowers Argent and in base an open crown of the Gules. (Gauld of Garioch) . SOURCE, NOTES & CREDITS: The blazon is based on information supplied by the armiger to include Lyon’s blazon of his arms. Biographical text is based on information found on pp 125-126 of Charles Burnett’s “Officers of Arms in Scotland 1290-2016”; page 1451, “Burke’s Landed Gentry, The Kingdom in Scotland, 19th Edition, 2001; page 22, “Burke’s Peerage and Gentry”, Vol. 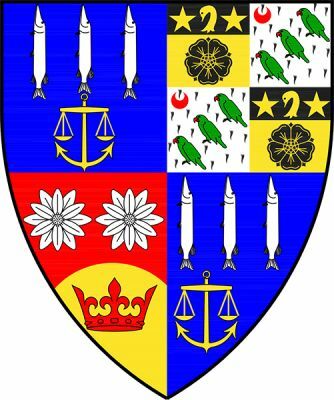 1, 2011; The Court of the Lord Lyon internet website regarding officers of arms; the Wikipedia article About Way of Plean; and information supplied by the armiger, adapted by Dwyer Wedvick. George Alexander Way of Plean, LLB, FRSA, FSA Scot., feudal Baron of Plean, was born in 1956, graduated from the University of Edinburgh 1978 and received his Masters from Pembroke College, Oxford in 2013. From 1985 until 2009 he was with at the law firm of Beveridge and Kellas SSC, latterly as a senior partner. He has served as Secretary to the Standing Council of Scottish Chiefs 1984-2003, is Past President of the Society of Solicitors in the Supreme Courts of Scotland 2002-2005, former Procurator Fiscal to the Court of the Lord Lyon in Scotland 2003-2010 and Falkland Pursuivant Extraordinary 2016-2017. Currently, he is Carrick Pursuivant in Ordinary 2017- and Sheriff in the Sheriffdom of Tayside, Central and Fife 2009-. This is all in addition to his regular work in heraldic and peerage law and judicial procedure. He has authored a number of books, perhaps the best known being, “Collins Scottish Clan and Family Encyclopedia which was co-authored by the late Romilly Squire ( 3rd edition came out in 2017 ). He is an Officer of the Most Venerable Order of St. John. On 7 Sept. 1980, he married Rosemary Victoria Calder, they have a son and heir, Michael Way of Plean, Younger, born in 1985. George Way of Plean married a second time in 2012 to Lynn Louisa Harrison. The most recent previous holder of the office of Carrick Pursuivant was Mrs. C. G. W. Roads 1992-2010, who was promoted Snawdoun Herald of Arms in Ordinary 17 December 2010.